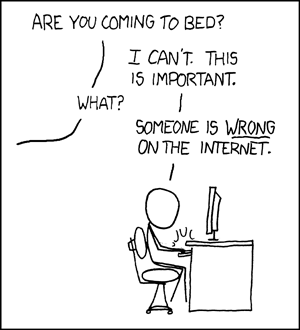 I spend far too long engaged in an activity I call “arguing with idiots on the internet”. I love it. I’ll argue over anything: religion, politics, who was the best Doctor Who, and sometimes I’ll even argue about things where there isn’t a plainly obvious right answer. But fairly often I end up talking about education. And inevitably the issue of the Behaviour Crisis comes up. And I have come to notice that the same three tactics are used continually by those who wish to deny what’s going on in our classrooms. They are so common that I think they are worth commenting on in detail. 1) The Circumstantial Ad Hominem. “Playing the man not the ball” is pretty standard for arguments on the internet, but for Behaviour Crisis denialists it tends to take two forms. The first is political. It is suggested that belief in The Behaviour Crisis must stem from either a political belief, or at the very least faith in reports that appear in a newspaper with a particular belief. This is not a terribly successful ploy to try with me (I don’t vote Conservative, read the Daily Mail or support corporal punishment) but I see this tactic used frequently. Ironically, it is particularly common from people who show plenty of signs of being blinded by ideology themselves. The second circumstantial ad hominem is based on our culture rather than my politics. Apparently people are prone to think that the young are behaving badly. Sometimes this is supported by a few bogus quotations from other eras to suggest that such feeling is something that cultures go through (see myth 3 here). Sometimes the phrase “moral panic” is used, but no strict guidance is ever forthcoming as to the difference between a genuine problem and a moral panic. It is perhaps an irregular verb: I have a legitimate concern; you have an agenda; he has a moral panic. Of course, the single biggest reason for finding it absurd that my views about the state of our schools is a product of political or cultural indoctrination is the fact that I am a teacher and see the truth first hand, although it is not unknown for people to suggest that I’m not really a teacher. (The ad hominems that acknowledge that I am a teacher I have dealt with elsewhere on my blog). 2) The Intertemporal Straw Man. This argument involves taking the claim that behaviour is bad and reinterpreting it as a claim that behaviour has got worse. Now I tend to believe classroom behaviour has got worse since, say, the 1960s for reasons I gave here (and because of the weakness of the arguments I have seen for the alternative hypothesis). However, I don’t think we can be precise; people who seek to attach the decline to one particular government or one particular education secretary are not convincing to me and I couldn’t even identify a particular decade or generation where the problem started. But what really strikes me about this line of argument is its complete irrelevance. If effective education is being obstructed by behaviour then what does it matter when the problem reached its current scale? When I look at American sources I get the impression that their behaviour crisis is a lot older than ours, but it doesn’t change my belief that it is a real problem. This argument is an effort to change the subject and we should not accept the Behaviour Crisis as an acceptable state of affairs whether it is recent or ancient. We know from other countries and good schools that it is not an inevitable and it is no more acceptable if it is a long term chronic condition than if it is a recent ailment. 3) Selectively Applied Criteria for Rejecting Evidence. The main reason we know there is a Behaviour Crisis is because we can go and see it by visiting schools. We can ask other teachers about it. We can go on to teachers forums and see what teachers say about it. We can look at surveys of teachers which describe it. Now, it would take a conspiracy theory of staggering implausibility to explain why it is so easy to find so many witnesses to a phenomenon which didn’t exist. We can find witnesses without really trying. Almost everybody knows somebody who quit teaching because of The Behaviour Crisis. Witnesses are everywhere and it is far from clear why any of them would lie. By contrast the voices who claim to have seen something different in our schools, while vocal and prominent, are overwhelmingly unreliable. Establishment figures of one sort or another (SMT, OFSTED, educationalists, consultants, even union leaders) who would be blamed for the problem if they were to admit it existed. What counts as evidence for a belief is a complicated philosophical issue. Different disciplines have different standards. What is evidence for a historian is not the same as evidence for a doctor or for a mathematician. It is always possible to find different criteria for accepting evidence, and so it is very easy to manufacture reasons to be sceptical of anything one does not want to believe. The evidence of the Behaviour Crisis is, inevitably, at some level based on what teachers have reported. So the two most common tactics are to suggest that what teachers see with their own eyes is either “anecdotal”, “unrepresentative”, or both. Of course, the claim that evidence of the Behaviour Crisis is at some level anecdotal is obviously true. All experience of ordinary life is anecdotal in the sense that we report it rather than have it measured by a machine or described by a unanimous committee of observers. This shouldn’t mean we disregard it. They’d be no recorded history if all eye witness accounts were to be ignored a priori, rather than analysed and compared with other accounts and evidence. Our lives are generally not recorded or validated by the authorities. Not all reports can be believed, but the idea that all reports provide no evidence is to assume that people are incapable of accurately reporting their experiences, which might be true in some areas of life, but seems a pretty implausible assumption when it comes to describing our classrooms. Ironically, the suggestion that evidence is “unrepresentative” is usually simply asserted without evidence. Statistical language is often used to obfuscate. Now, obviously, any evidence collected can be biased by the method of selection. Equally obviously, all sampling provides only an estimate of the attributes of the entire population. Neither of these concerns is a major problem if what you are investigating is questions such as “what is normal in our schools?” or “what is common in our schools?” We can allow an enormous margin of error for the answers to these questions. For behaviour to be a big problem in education it doesn’t matter if it is disrupting teaching in 15% of our classrooms or 100%. We can’t afford to write off a large chunk of our education system into ineffectiveness, particularly as problems with behaviour are not likely to be evenly spread across the education system affecting primary as much as secondary, selective as much as comprehensive and private as much as state run. Once this is acknowledged most claims to evidence being “unrepresentative” become ridiculous as a statistical argument. In my experience, such discussions usually reveal that the denialist has some basic misconceptions about statistics, such as believing that a large population size makes a sample less representative, that small samples can tell us nothing at all, or that the risk of bias in sampling cannot be accounted for in statistical calculations. Of course, the Behaviour Crisis denialists never adopt the extreme sceptical position to any area of life where there is evidence which supports their own beliefs. (I tried applying their sceptical principles more widely here.) Normally they fall apart when asked to say clearly under what circumstances they would listen to teachers. It is easy to make rhetorical points about being devoted to the evidence, but far harder to justify ignoring people with obviously legitimate concerns. At its most extreme this form of scepticism is used to suggest that it is outrageously “unscientific” for politicians to believe what voters tell them about their experiences. It does not take much reflection to realise the implications for democracy if voters are to be routinely ignored, and it is not surprising that many Behaviour Crisis denialists will call for education to be “taken out of politics” or, in other words, taken out of democratic control. I have one issue with the Intertemporal Straw Man argument. The word ‘crisis’ is usually defined as being time-specific, i.e. the culmination of a series of events where we are at the most important ‘breaking’ or ‘turning’ point. The word ‘crisis’ in the term ‘behaviour crisis’ may be the bit that people are objecting to if they feel as though behaviour is only ‘as it has ever been’. Obviously, you can then debate whether or not things are worse than ever – or whether or not this particularly moment in time is the breaking/turning point. But to say that debating when things are hitting their peak is irrelevant, or that something could have been gong on for a long time, is somewhat to misuse the term ‘crisis’. are inherently contradictory. I might also add that the argument takes pretty much the same form without the word “crisis” which I admit does reflect my feeling that the issue is.urgent. You know who the last person was who said there was a Behaviour Crisis? HITLER. How do you feel now? Brilliant stuff (before I get hate spam from your henchmen). I *would* say those phrases are inherently contradictory. Well, a bit of Googling suggests those phrases are used relatively often without an obvious intention to be incoherent. So, what can the average, everyday, run of the mill teacher do to change things? Anything? Probably not, but I am tempted to suggest being chained to their desk and being forced to wear something like those dog collars that deliver a shock when “needed” to correct whatever the dog is doing wrong. On the other hand, I kind of hope that society in general decides that making a decision to behave badly is sooner or later self-destructive. It is something of a minor comfort to me that the political parties are PERHAPS willing to accept there is a behaviour problem in uk schools. I welcome the improvement in sanction laws by Labour and the possible enhancements by the coalition. Of course, what we also need is supportive SLT to ensure teachers are supported and 99% of the behaviour would go away. And what of the parents? I have always thought it scandalous that the ethos of a school could be so hindered by a minority of argumentative and difficult parents. Schools need strict, fair, and consistent rules on courtesy, uniform, respect and learning. Any parent seeking to ‘absolve’ their child from these parameters should be outed as the pariah they are. I think ‘Crisis’ is exactly the right phrase as it indicates the urgency and severity of the issue. Also, in my view, talking to colleagues over the years, that generally speaking courtesy has gotten worse year on years for decades. ie a 70’s teachers would be appalled at the 80’s classroom and the 90’s teacher at the 80’s classroom. Im aware of plenty of schools that buck this trend- in both directions- I speak in general terms only. The Steering report that suggested discipline is ok in schools is a terrible, terrible betrayal of children and their teachers. Utterly morally reprehensible of the authors concerned- for the document isn’t just the work of one person. Thank you – a reassuring but unfortunately accurate article. To me this is one of the most important issues in education today as it has much wider and far-reaching implications beyond the classroom. Yet even if such behaviour is recorded on tape, such evidence is sidelined or ignored by the general media. Call me paranoid but it’s as though there is a media blackout. Private Eye had several pages covering NHS whistleblowing in their last issue – yet nobody in charge seems to want to have to deal with this very big problem in our state schools which several teachers have tried to bring to the public’s attention. We don’t know this necessarily. I could assert -with some justification-that many schools are ‘good’ because one of the things they are good at is not admitting disruptive pupils. I’m also quite convinced that once a state has been reached in which reasonable behaviour has become the norm, it becomes relatively simple to maintain that state since there is a huge pressure toward conformity and student behaviour becomes more stable, ‘robust’ and far less liable to subversion in the future. I happen to teach at a school where we are never likely to achieve that ‘critical mass’ which might lead to conformity being accepted as the norm. If we could lose 40-50 kids for 6 months just to get the ball rolling…. As for ‘other countries’, given the connection -I hesitate to say correlation due to the complexities, intangibles and inherent uncertainties- between wider societal attitudes and behaviours and those of school pupils, I think evidence from other countries would, at best, count as circumstantial. I don’t accept that many schools at all could achieve good behaviour from reaching a “critical mass” of well behaved pupils, who then enforce high expectations on the rest of the pupils. Discipline is not the job of students. I think groups of children will invariably move to the lowest common denominator without an utterly exceptional concentration of personalities. Nor do I accept that the social pressures from outside (which you mention when rejecting comparison with other countries) are as decisive as you claim. Most behaviour we see in schools is kids getting away with what they expect to get away with because they do get away with it. Now, in most schools this is not because the bad behaviour could never, ever be contained no matter how much we try. In most schools there is simply no attempt to try. There is no significant investment in the school’s capacity to deal with poor behaviour and no acknowledgement that the school as a whole, rather than some individual teachers, has a behaviour problem. To refer to what you mentioned, it is not actually that difficult for a school to make provision for 40-60 kids away from the rest of the school population if the will is there. Some schools do have a situation where the number of permanent exclusions, managed moves, learning support unit places, college placements and pupils persuaded to leave are in that order. But this effort is exceptional and I’ve only seen it in a school that needed to get rid of about twice that number. Now that said, what I am writing about here in this post is not how to deal with the problem. It is about acknowledging the problem exists. If the education establishment said “we admit the problem but it is beyond the capacity of schools to deal with it” then we would be in a fundamentally better situation than where we currently are, where people are scared to acknowledge the problem. We could create pressure on government to change the environment in which schools operate. We could stop looking for scapegoats and persecuting those who identify the problem. We could look at what interventions have worked and what haven’t. In the worst case scenario, we could even give up on educating the ineducable and at least ensure the majority of children had an undisrupted education. Surely, even that would be better than the denialists preferred course of simply pretending the problem doesn’t exist and demonising people who dare speak up for the interests of children in our education system? I’m not suggesting that discipline is the job of the students, nor that they’re conscious agents in maintaining discipline. I’m asserting that a critical mass of compliant students acts as a control and influences other students through a process of acculturation; this is hardly a controversial or extreme view applied to human society in general. I’d even venture it’s an a priori assumption in any discourse on human behaviour. As, of course, is the ability of a sufficiently aggressive, determined or ruthless minority to effect changes disproportionate to its size or level of popular support if the particular society in question lacks the administrative competence or moral will to resist. Societies with a significant majority law-abiding, contented citizens and competent administration and law enforcement don’t tend to fail through internal strife, nor do they find the maintenance of law and order especially burdensome. That’s because you seem to suggest that children…and I imagine human beings in general… will tend to devolve to behaviours you categorise “lowest common denominator” in the absence of external restraint. Even if this were true, then presumably their ‘individual lowest common denominator” would be determined by their background, levels of aspiration, socialisation and maturity. This implies schools with a majority of pupils with relatively high measures of aspiration, social responsibility and maturity will never devolve as far as less fortunate schools and, with competent administration, will be relatively easier to maintain. Since “aspiration, social responsibility and maturity” are, in the main, an external endowment -despite the valiant endeavours of the nomenklatura of Tonbeeite, useful-idiot, PHSE coordinators or devotees of the ineffable SEAL god – and so might be reasonably termed “social pressures”. I’ve never seen this. I’ve seen: incompetent or insufficient attempts; well-intentioned, determined but misguided attempts; desperate, drawn out wars of attrition resulting in unsatisfactory compromise, well short of the intended goals; and successful attempts-but only in schools which achieved, either,by good fortune or through a combination of Herculean effort and exclusions, a critical number of amenable students. I’d suggest some schools patently lack the good fortune and could never, despite the most extreme efforts, maintain more than a compromised stand-off – this doesn’t make me pessimistic; it makes me more certain that what’s needed is an increase in benign “social pressure”…the exact nature of which is, naturally, somewhat subjective. I do not want to make a claim about human nature in general when I talk about “the lowest common denominator”. But I have seen, again and again, that where there is unrestrained bad behaviour alongside good behaviour among children, it is the bad behavour, not the good, that grows. With regard to the point about schools trying. There is often a fine line between incompetence and neglect, but I have encountered many schools where management simply refused to invest in the school’s capacity to deal with behaviour. I have worked in many schools where the SMT line was that behaviour in lessons was simply a reflection of teacher competence and that responsibility for behaviour was, at most, departmental or pastoral. The “cupboard charlies” were a majority of SMT in most schools I’ve worked in. I love what you say about evidence. When I blog I often feel like I could quite easily be called out as a purveyor of opinion and anecdotes, and I have no ‘evidence’ to back it up. But the opinion of the professionals is the evidence. I have a friend who is a prison security guard who says they get a lot of 20somethings coming in who ‘just don’t care’ and behaviour is noticeably worse in there too. There is a huge problem with behaviour, specially in areas where poverty, deprivation and ignorance are high i.e where education is needed the most. I know, I have seen it. The problem could be tackled but it is easier (and a whole lot cheaper) to blame teachers for being ¨weak¨ than it is to redistribute wealth and opportunity. So long as the elites have their own schools, and universities, you can forget all about any hope of change or improvement. Sorry, but that is the way it is. Do not think that you need to talk truth to power. Power knows all about it! Andrew, I would post this over at Local Schools Network but I’m scared of their attack dogs. I’m very grateful you keep challenging the ridiculous nonsense they are putting out, but I worry for your sanity. You do realise that you have no chance in hell of changing the minds of the died-in-the-wool middle class marxists over there? Unfortunately, not because of reasoned argument. Caroline – try posting it on mumsnet -you’d find it equally frustrating. I don’t bother with it since posting a few educational threads and experiencing the attack dogs over there. This is why nothing changes – nobody really challenges the system en masse – even parents. seriousteacher – I do think Beavis the Butthead at LSN is worse than anything the mums can conjure up. Yes. I’ve come across this frequently too; and it’s quite frustrating. That said, although I think this attitude results from a combination of a delusional adherence to “child-centred” philosophies together with managerial incompetence…impotence even, it doesn’t actually deny the problem so much as misdiagnose the cause. I suppose by that logic, they’re only failing to act if they don’t address this perceived teacher competence. In my experience they do try -ineffectively, inappropriately…often even unfairly…but they do try. The problem, of course, that they’re not addressing the real cause. a) It’s ideal for deflecting or displacing blame away from them personally. In that sense a “child-centred ethos”..whatever that actually means…is a managerial godsend. b) Given the above, what chance does anyone have of moving into management who thinks differently- or at least openly admits to thinking differently? It’d be trying to get on the board of Goldman Sachs on a platform of scrapping bonuses. c) Some of them seem to lack the imaginative force to locate the single, seemingly-contrite individual who assures them of future compliance within a setting alongside his or her confederates in a crowded classroom. I’m not sure we are actually disagreeing on much here, I just can’t bring myself to describe any action that is based mainly on distributing blame as “trying to do something” about a problem. I think it is the opposite. It is an excuse for not doing anything. I’m not sure I thought we ever disagreed on that much; one or two minor quibbles about phraseology maybe. However, with regard to “distributing blame”, I don’t think they’re actually doing nothing. They’re acting perfectly consistently with a philosophy which, regardless of its incongruence with reality, has proved self-serving, self-sustaining, politically expedient and can conjure a “Get Out of Jail Free card” for each and every occasion. A philosophy like that can survive without evidence or credibility; it gets by on pure utility; it becomes an all-too-convenient myth. But that’s hardly unique to education. I’d also like to point out that in denying that your “lowest common denominator” hypothesis only applies to “children” and so doesn’t make a general statement about human nature -or societies- suggests a sort of individual threshold of moral maturity/ collective consciousness. Presumably this threshold is achieved by -maybe is a condition of- ‘adulthood’?…and further, is almost certainly a age which is both genetically but largely socially contingent. Perhaps a school in which a majority of pupils reach this threshold significantly prior to the national median might be deemed to have reached its “critical mass”. That said, I know plenty of people into their 40s and 50s who have failed to clear the bar. With regard to the lowest common denominator comment, I am basing it on observation and haven’t really worked out a theory behind it. Thinking about it, while maturity is probably the main factor, I also think there is something unique about the school environment and being forced together with people your own age. When adults fall out they can often simply avoid each other in the future. Children often don’t have that freedom and it does make finding one’s place in the social hierarchy that more urgent and important and confronting the bad behaviour of others that much more dangerous. When I was around the age of 14 and preparing for the GCE O level examination in history the teacher delivered his lessons sauntering around the classroom, generally at the back, delivering an exposé on, by example, Disraeli’s second ministry. Questions would be fired at intervals, incorrect answers were sometimes indicated by a smack. Anybody appearing not to be paying attention would receive a blow to the back of the head, or if out of reach would receive an accurately thrown board rubber to the head. A teacher, I can’t remember what he taught, who led a platoon at Arnhem, seriously lost his temper with a particularly exasperating pupil. He knocked the pupil to the ground with a tremendous blow and proceeded to give him a savage kicking. To this day I recall the scene. I still correspond with an old school chum who also has a similar recollection of this incident. Some teachers wore academic regalia which made them more intimidating. There was less bad behaviour in my schooldays but perhaps it was just a case of keeping the lid on. I wouldn’t advocate a return to those days with the exception of, perhaps of letting them go at 15.